It was not uncommon in India at the time for young girls to be given to the local Hindu temple. This saved the family of the girl money because they did not have to take care of the young one who was considered a drain on finances--unlike a son--and made money for the priests who often sold the young girls as prostitutes to help cover the expenses of the girl and the priest who controlled her. Amy couldn't bear to let this happen and so she devoted herself to rescuing these young girls and housing them in whatever way she could. Soon, she had founded the Dohnavur Fellowship and provided a safe haven for over one thousand children who might otherwise die or be forced into prostitution and/or slavery. 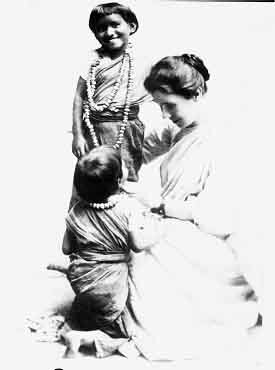 Given her devotion to pursuing and rescuing the abandoned children of India, it was no surprise that Amy insisted: "One can give without loving, but one cannot love without giving." Amy gave much and loved much because she had been intricately and elegantly designed to share God's love with people who needed it desperately. Amy died in 1951 due in part to complications from an earlier injury obtained in her pursuit of ministry. In accordance with her wishes, she was buried in India near the Dohnavur Fellowship without a gravestone. The children she had loved and cared for in India had to do something for the woman they loved and remembered. They put up a fountain for birds over her grave and ibscribed the hindi word "Amma" upon it. This word perfectly condensed God's intricate design into one word: "mother." I had heard the eyes story long ago and now wanted to pass it on to some children so glad to be able to verify it here. Thanks. I also had heard the story of a missionary who longed for her brown eyes to change colors (I remembered green for some reason). I heard this story when I was 8 years old, and it was very moving at the time. Still, almost 30 years later, I think of it often, but did not know who it was about. I'm glad I came across this article!